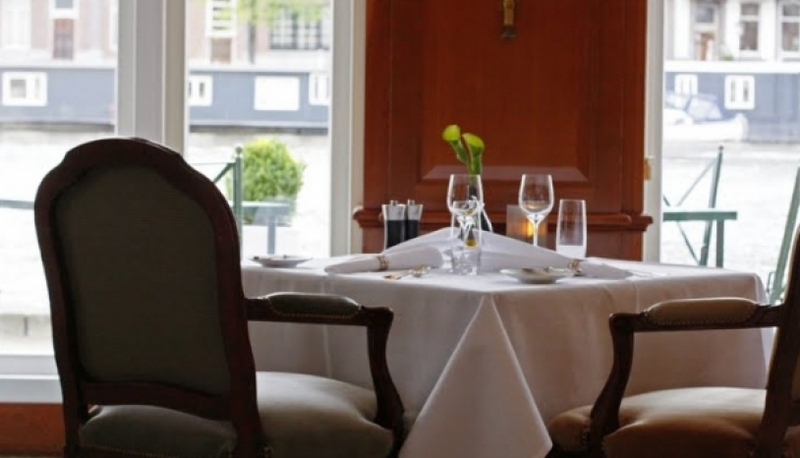 1.The French cuisine restaurant La Rive in The Intercontinental Amstel Amsterdam Hotel is one of the leading restaurants in Amsterdam, which offers the large selection of exclusive vines in the city. It is situated near the Hermitage Museum. The guests of the restaurant may enjoy luxurious décor and gourmet meals of French-Mediterranean cuisine, as well as the incomparable view of the river Amstel. An average dinner costs 100-150 euros. 2. The Okura Hotel, the member of the Leading Hotels of the World, calls attention to the Ciel Bleu restaurant. It is located on the 23rd floor, so the visitors get the amazing city view. The restaurant consists of 3 halls, each of them is equipped with TV-screens, where you can observe the cook at work in real time. This is the only city restaurant, crowned with two Michelin stars. A dinner costs around 120-180 euros. 3. The uniqueness of the restaurant De Kass is that it is located in greenhouse. In 2001 chief cook Gert-Jan Hageman converted the old greenery, built in 1926, to the luxurious restaurant, which sits close to 200 people. It is situated in Frankendael Park. The visitors can plunge in the atmosphere of plants and nature. There is a nursery, due to glass roof and walls. All meals are prepared with fresh meat and fish, using herbs, spices and vegetables, raised in the nursery. In sunny weather you can dine alfresco in the garden. There is no standard menu, it changes daily depending on the nursery harvest. The restaurant offers the three-course dinner for €49.50. Also you can reserve a table for 4 persons straight in the kitchen, where you can watch the chef cook himself, preparing your meal. This dinner, including wines, would cost €130 per person. 4. In the city centre the De Silveren Spiegel Restaurant offers to taste traditional Dutch dishes. The name ‘De Silveren Spiegel’ in translation means ‘a silver mirror’. The restaurant is settled in the 17th century mansion. The building is possibly preserved in its initial state, what enables to convey the atmosphere of that time. The restaurant stuff may help not only to choose the right course and fine wine for every taste, but to give a detailed account of the building and its remote past. By the way, 21-year-old Yves van der Hoff, the most fashionable chief cook of Amsterdam, is the head of the restaurant. He acquired incredible skills, which alongside with his inquiring mind and energy had a great impact on the restaurant’s success. 5. Another famous place, where you can try traditional Dutch cuisine, is the D Vijff Vlieghen Restaurant, which name means ‘five flies’. 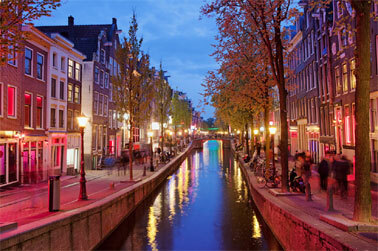 The restaurant is situated in the centre of Amsterdam. It has nine halls, settled in five united buildings. Each hall is filled with its own unique atmosphere and antiques collection. It’s not a common restaurant, it’s a real culinary museum. Here you can find the 17th century dishes, the old guest books collection, kept since 1946, with the entries of famous people, such as Walt Disney, Mikhail Gorbachev, Dmitry Medvedev, Samantha Fox, Tyra Banks and others, the originals by Rembrandt , antique ceramic tile and many others. The design of the restaurant and the traditional Dutch cuisine dishes evokes the exceptional feeling of the ancient Dutch city.